One month of the season is in the books. The Blue Jays are guaranteed to be over .500 for the month for the first time since 2012 when they finished 12-11. The start to the season is a vast improvement from 2017 when they had more than double the number of losses than wins. The team is pretty much healthy which has been a big plus. They have also had unexpected strong starts from players such as Luke Maile and free agent signing Curtis Granderson. The past 2 weeks have been a bit rougher with 3 straight series losses to division rivals NY Yankees, Boston Red Sox and Texas Rangers. Here are 10 random thoughts from week 4 of the MLB. 1. What is wrong with Marcus Stroman? He has the 6th worst ERA in the AL among starting pitchers (8.88). Only Erasmo Ramirez, Alex Cobb, Josh Tomlin, Miguel Gonzalez and Daniel Gossett have worse ERAs currently and two of them (Gossett and Gonzalez are currently injured and on the DL.) Stroman had a rough start on Friday giving up 4 runs while recording just one out. While the Blue Jays did come back from that deficit, they were unable to comeback after Stroman gave up 2 more runs in the 6th. Marcus Stroman did have a delayed start to spring training as he was shut down from throwing for a week with shoulder inflammation. Is the shoulder still bugging him or are his mechanics off? The Blue Jays need Stroman to figure things out soon because if Joe Biagini is pitching in the rotation long term it won't be good for the Blue Jays prospects. 2. The issue of pitch counts has come up again this week. Oakland A's starter Sean Manaea threw the first no-hitter of the season last week. Several pitchers had no-hit bids going this season, only to be pulled due to a perceived pitch count. ESPN's Sam Miller wrote this interesting article on how no-hitters are becoming more and more rare. We might see a season where there are no no-hitters or perfect games. 3. Further to the pitch count issue is the over-use of bullpens. Coming into Saturday's game, just 3 starters (JA Happ, Marco Estrada and Aaron Sanchez) have pitched 7 innings or more. This week, Sanchez was pitching a 3 hitter after 6 innings and was pulled because he had thrown 97 pitches. 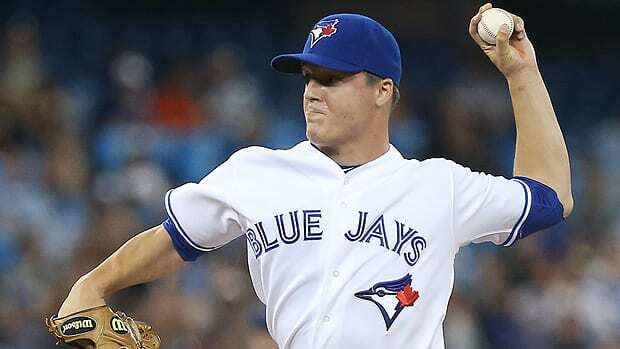 Danny Barnes gave up a pair of runs which cost the Blue Jays the game and Sanchez a win. Several of the pitchers in the bullpen are looking at 80+ appearances unless the Blue Jays starters can pitch deeper in the game. Pitching that much is going to increase the likelihood of injury from pitching too much and the effectiveness of the overworked reliever will go down. Part of the problem is the Blue Jays really don't have a reliever who can throw more than an inning. Happ pitch 7 strong innings Sunday. 4. Blue Jay who has impressed me most the first month of the season: Curtis Granderson. The 37-year old free agent signing has been great at the plate. He is batting .317 with 3HR and 12 RBI, including a walk-off HR this week off Craig Kimbrel and a game winning HR in the top of the 9th off Darren O'Day April 10. As a pinch hitter, he is 3-6. This has been a great signing by the Blue Jays. 5. Blue Jay who has disappointed me the most the first month of the season: Randal Grichuk. Pegged as the starting right fielder, Grichuk has 5 hits in 63 AB and has struck out 24 times. He has effectively lost his starting job to Teoscar Hernandez, although Hernandez looks better as a left fielder. Perhaps one reason for the struggles is having to get used to AL pitchers he hasn't seen much. Grichuk came over from St. Louis in an off-season trade that saw Dominic Leone go the other way. At the same time, Yangervis Solarte is also coming from the NL and he has adjusted okay to AL pitching. Grichuk had a good game Sunday with a 2-3 effort at the plate, a pair of RBI's and a great catch to end the 1st inning. 6. One stat that has been non-existent for the Blue Jays is sacrifice bunts. The offence this season has been heavily reliant on the long ball. Take Saturday's game for instance, the Blue Jays scored three of their four runs with solo HR. Texas scored four of their runs with the long ball but also scored with a double and single. Kevin Pillar and Curtis Granderson both have great control of their bats and are capable of dropping down a bunt. It also forces the defense to play differently and can keep teams out of double plays. 7. How about the Arizona Diamondbacks? They have won every series they have played so far. They are tied with Boston for the most wins in the MLB with 19. The crazy thing about their early season success is they are doing it with only one batter hitting over .300 (David Peralta @ .302). Two of theire starting pitchers have ERAs under 2.00 (Matt Koch @ 1.93 and ace Patrick Corbin @ 1.89). The first couple weeks of May look challenging for the Dbacks with 2 series vs. the LA Dodgers sandwiched with a series vs. the defending WS champs Houston Astros. They also face Washington in the second week of May. 8. The Cincinatti Reds have been very bad this season, having won just 6 games this month. The poor start cost Manager Bryan Price his job April 19. Only Jesse Winker is batting over .300 (batting .309). Two of their pitchers have 30.86 and 31.50 ERAs (two appearances each -- small sample size). The Reds are actually relatively healthy, with just 3 players currently on the DL. Cincinatti's struggles can be attributed to poor pitching and a lack of experience. Canadian Joey Votto is hitting .273 with 4HR and 14RBI. 9. The big Blue Jays news Sunday was Devon Travis being optioned to AAA Buffalo. Travis has been struggling all season with just 9 hits in 61 plate appearances. Unfortunately, call-up Lourdes Gurriel Jr. has been playing well. It could also be an indication that Josh Donaldson is close to a return. I still think Devon Travis was mishandled this month. The Blue Jays wanted him on a reduced playing schedule to "save his legs". However, they could have given him a half day off by DH'ing him, especially with JD and Kendrys Morales on the DL at the same time. 10. Blue Jay of the week: Aaron Loup. In a difficult week for the team where they lost both series this week, Loup pitched really well. He pitched 4 perfect innings this week and struck out four batters along the way. He has retired 13 straight batters.